CCF Unit Leader getting instructions for assault. 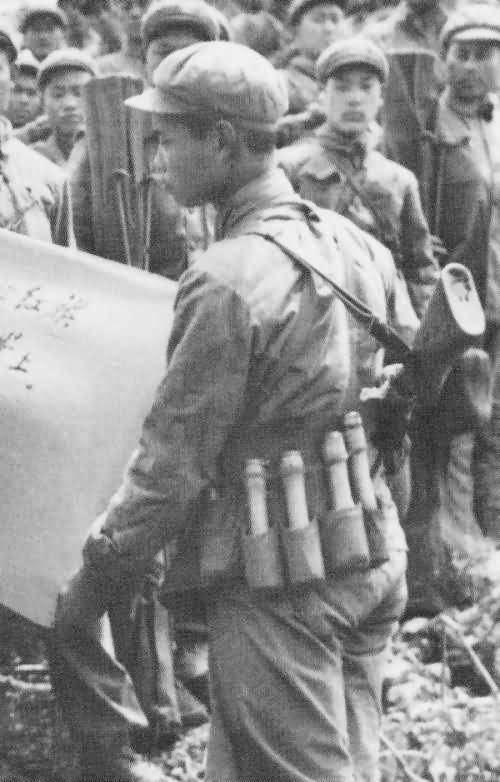 Note the canvas carrying pouches for the stick grenades used in assault. The hollow handle of the stick grenade has a ring, pull cord, igniter and a 3-4 second time delay. In action, the wooden top is unscrewed, the ring slipped over a finger, and slinging the grenade pulls the cord activating the igniter. He is carrying a Russian model 7.62mm SKS rifle, which he would carry into the action after trying to confuse and stun the target troops with one or two grenades. Against a resolute defense, assault troops didn't worry too much about the dangers of cigarettes, or a good retirement plan.